Microbrewery U Dyje. The family brewery, founded in 2012, earned its name from its location, directly on the river Thaya (on the right bank) in the village of Sedlešovice in the southern part of the historic town of Znojmo. The beer here is brewed in the classic way, in which the main fermentation takes place in open tanks and fermentation then takes place in standing tanks for about one month. The beer is not filtered or further treated, so it is a natural product. 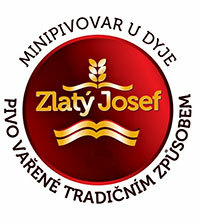 Zlatý Josef – a light unfiltered and unpasteurized lager. Ingredients: water, Moravian barley malt, hops, and brewer's yeast. Alcohol content: 4.9% Taste: full malt with a minor fine bitterness. Tmavý Josef (not in permanent offer) – a dark unfiltered and unpasteurized lager. Ingredients: water, 4 types of malt, hops, yeast. Alcohol content 4.9% Taste: full malt with a higher fine bitterness and caramel-coffee aftertaste. Bowling bar, Znojmo, guesthouse and restaurant Blanka, Nový Šaldorf, U Pramene, Hnánice. Also sometimes at the pubs U Šneka in Znojmo. Also in Brno, Prague, and others.